It’s that time of year again. School is back in session, football is ramping up, baseball is coming to an end, and the change in seasons is driving us all to look for new fall activities. When I was a kid, my parents rarely worried when I was out. I’d like to think they cared about me and were just less paranoid. I didn’t even have to wear a helmet on my bike. Today, it’s a different story. Parents, including myself, worry about everything – where my kids are, what they are up to, who they are with, who they are texting. If parents could have drones monitoring their kids’ every move, they probably would. This fear shouldn’t keep us from living an active lifestyle. Two activities that you can enjoy with your kids, friends, or even co-workers, are paintball and laser tag. They both have elements of adventure, competition, and imagination – imagine you are a hunter, soldier, or cowboy. Best of all they offer an escape from everyday life, cell phones, computers, Facebook, etc. They are the most fun when organized with a group – pitting work groups, family, church members, and club members against each other for a good team competition. If you think safety is an issue, you’ll be surprised how safe both activities are. According to Paint-Ball.org, in the United States, there are 0.2 injuries per 100,000 exposures to paintball a year. This is one of the lowest levels of all sports. In fact, it’s lower than jogging. Paintball facilities follow strict rules and guidelines and carefully monitor players to ensure rules are followed to ensure safety. Helmets and masks are required. Gun speeds are set from 170 to 300 feet per second to keep hits from being too painful. Paintball masks are designed to withstand the force created by the mass of a paintball travelling at 300 feet per second. Any other type of mask is not allowed. This rule is so strictly enforced that many places will have players sent off the field for taking their masks off for even a split second. According to Patrick Stapleton, owner of Paint Pursuit Games, Paintball is one of the most fun activities available for groups to get away from the routine of everyday life. It’s great for team building, family bonding, birthday parties, and more! It’s an experience that releases stress and creates a long lasting memory. 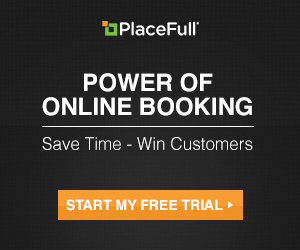 Find Paintball Fields Near You! The term “LASER” is an acronym for light amplification by stimulated emission of radiation. The term “laser tag” was coined back in the 1970s following the launch of the original Star Wars movie and the subsequent popularity of the sport of indoor laser tag. The lasers used in laser tag are classified as Class 2 type. A Class 2 laser is safe because the blink reflex will limit the exposure to no more than 0.25 seconds. Many laser pointers and measuring instruments are Class 2. Many laser tagger units emit invisible, harmless infrared light, just like the infrared used in many TV remote controls. Worldwide, there are no reported eye injuries caused by these types of lasers. Use of commercial fog is used to enhance the experience, which is composed of food-grade mineral oil. According to Erik Guthie, VP of Sales and Marketing at Zone Laser Tag, Laser tag is more popular today than ever before. There are now nearly 1,000 laser tag facilities throughout the United States and about another 80-100 opening every year. Laser tag is enjoyed by over 1 million players every month in the United States and even more worldwide. It’s safe for kids, teens, and adults. 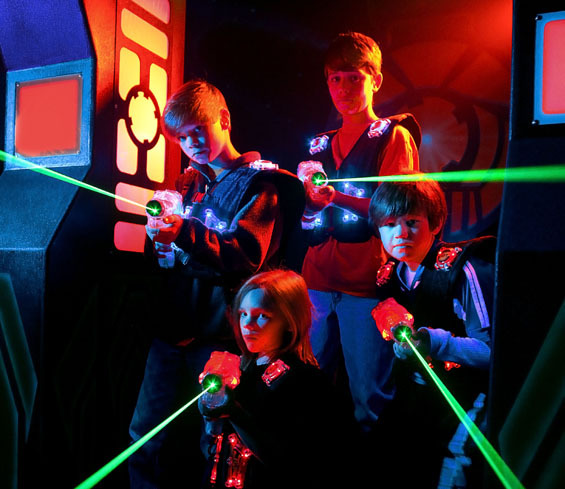 Find Laser Tag Places Near You! Why are they so fun? 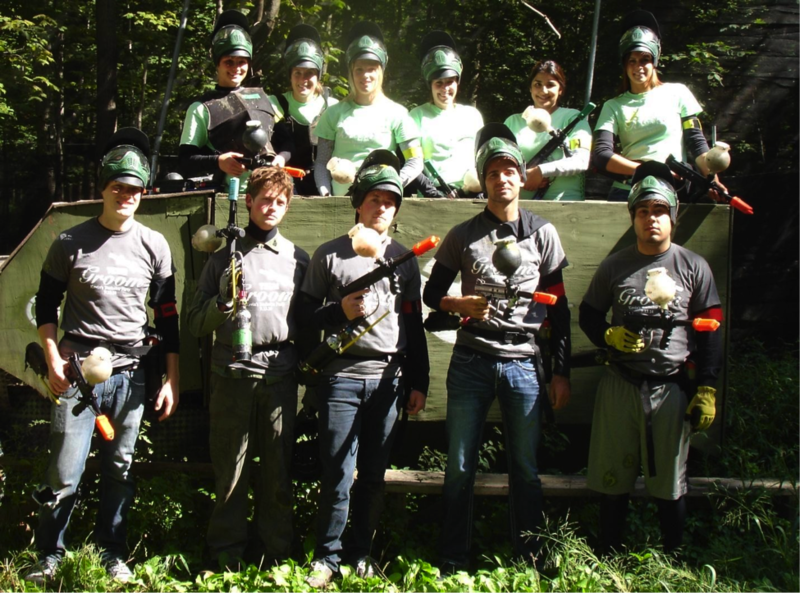 Both paintball and laser tag are physical activities which can easily be played by anyone. Many girls love to play laser tag – think The Hunger Games. It’s not just about the physicality, but the adrenaline you get competing with friends, workers, or enemies, if you have them. It’s exercise minus the hassle of buying equipment or getting up early in the morning. Both paintball and laser tag can be played in groups. If you don’t have a group, you can also play with other teams or individuals who need more players. Participation fosters teamwork and strategic thinking among players. Plus, it’s a great way to determine who you can really trust. You can play out a fantasy, whether it is being a hunter, soldier, cowboy, spy, or assassin. Be someone else for a day, use a disguise, have a secret code, or use sign language. These activities give you a chance to play with or against your friends, or better yet, against your enemies! In a friendly way, of course! So call up your friends, call up your demanding boss, and settle it once and for all with a game or two! Size doesn’t matter! Calling all little siblings – this is your chance to be strategic, tactical, and creative. It’s time for older brother or sister revenge. 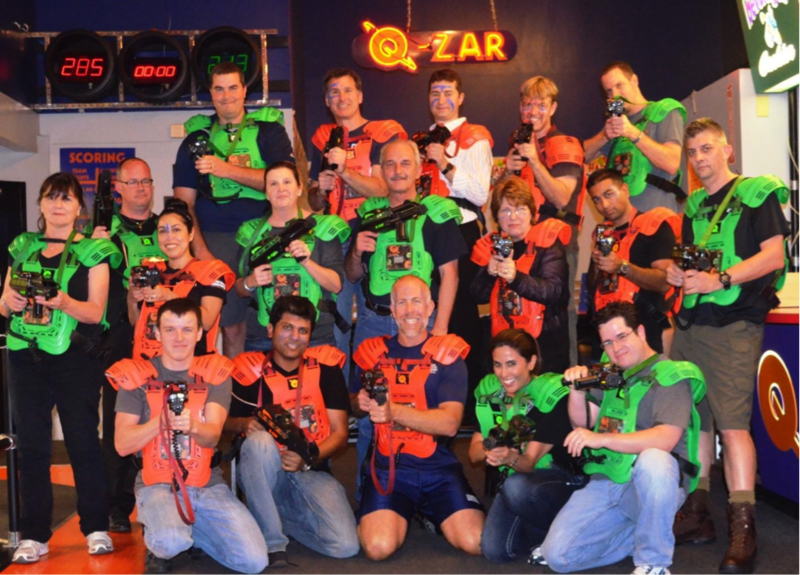 According to Brad Cohen, owner of Q-Zar Laser Tag, people love to play for a variety of reasons. Zapping the boss is great therapy. Q-Zar brings out the best in people and shows them the skills of teamwork. It’s a great alternative to the usual birthday parties and a great way to burn off energy.” My business does not require waivers or helmets. It’s extremely safe…if you do not run, wear spiked heels, or wear flip flops. Life doesn’t have to be boring to be safe. Kids can still be kids, and adults can be adventurous. Life’s too short not to have fun! Let us know what you like most about paintball or laser tag, comment below. Categories: Paintball News, Uncategorized | Tags: laser tag, paintball | Permalink.